Nikesh Shukla is the author of Meatspace, Coconut Unlimited (which was shortlisted for a Costa Book Award), The Time Machine (which won best novella at the Saboteur Awards 2014, and Simon reviewed here) and Generation Vexed (a non-fiction book co-authored with Kieran Yates). He wrote the multi-award winning short film Two Dosas, a Channel 4 sitcom pilot called Kabadasses and has contributed to Buzzfeed, Guardian, Independent on Sunday, BBC Radio 4 and many more. He also sent a lambchop into space, which was nice. He talks about race, rap and comics a lot on Twitter. And is a new dad. Which supercedes all of this. I keep everything I plan to read at some point. I’m getting to a point where my shelves contain more unread than read books, which is very different from how it was when I was growing up. I read everything on my shelves. And I kept everything on my shelves. Even stuff I didn’t like. I didn’t have much access to books as my local library was small didn’t stock what I wanted to read. I was obsessed with reading writers that looked like me (not white) so I had to buy everything. And I read it all. And quickly learned that much as I felt this compulsion to read writers I felt a cultural affinity for, they had more than one story. And it was ok to not like them all. I think that’s the problem with the attitude to writers of colour today – people still assume we only have one story to tell. Sorry, I’ve gone off topic. To bring it back, I junk books I’m not enjoying when I know I’m not feeling them, and I eject from books I like when I feel like I’ve got it. I hold on to the ones I like in case I need to revisit. The culled ones, twice a year, I take them to my work and host a free-for-all. They started off alphabetical – A-Z fiction, A-Z non-fiction, A-Z short stories and A-Z homeys (books by my friends) but I’ve just given up at this point. My TBRs are by my bed (growing perilously tall – if it’s suddenly announced that I died when the new Paul Murray book fell from a giant height and smashed my nose into my brain, don’t suspect foul play). We also now have children’s books, picture books and board books everywhere because we’ve read to our baby at a young age. We’ve put most of her favourites in a box in front of the television. I have an orange shelf to match the orange of my study walls. The paint colour is the same Pantone as the cover for Coconut Unlimited, which I love. 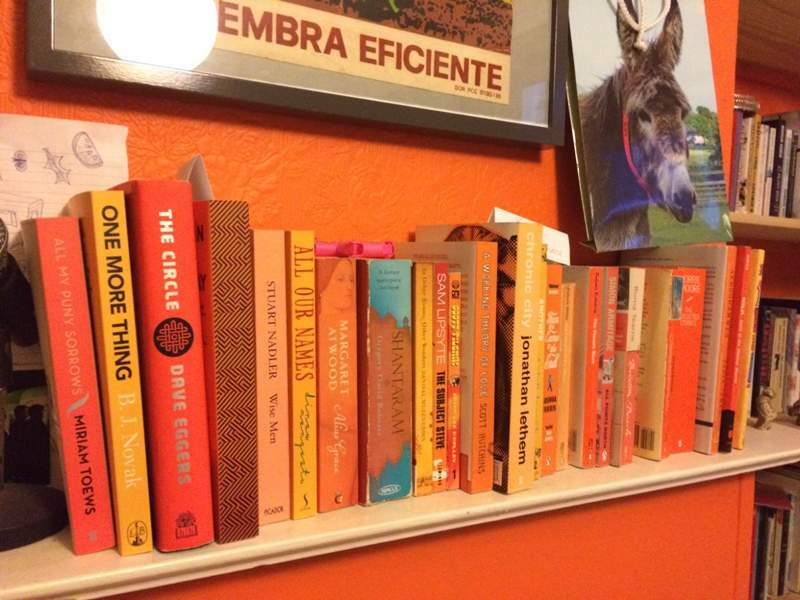 I have a shelf of books that is my ‘study of orange’. I love the colour orange, it’s auspicious in my family’s cultural heritage and it makes me happy. I have a t-shirt with Hindi on it, which translates as ‘In the game of life and death, we’re all oranges’. Oh god, wow, this just dredged up a memory. With money I borrowed off my dad, I bought Better Than Life by Grant Naylor. It was the second of the Red Dwarf books. We were in a rainy hotel on a weekend away in Portsmouth and I had seen a friend reading it at school, and was desperate to also read it, because I was obsessed with Red Dwarf. Mum was really pissed off I bought it because it was Red Dwarf and therefore silly. Not a proper book. It taught me a lot about comedy. I stayed up all night reading it in our tiny family bedroom, biting the sheet to avoid LOLing. I don’t think so. I think I’ve charity shopped the ones I’d be really embarrassed about. For two weeks, in 2004, I read every Dan Brown book that was out. I’m sorry. I’ll never do it again. 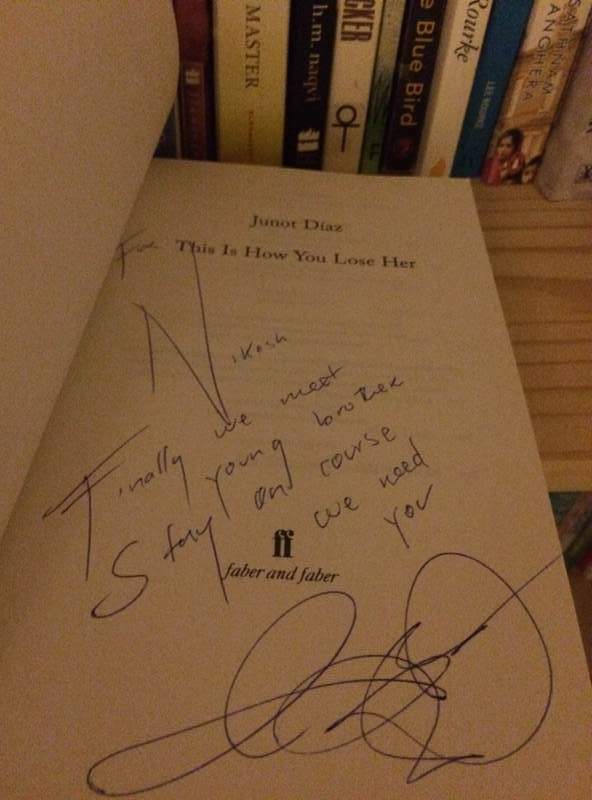 My copy of Junot Diaz’s This Is How You Lose Her is signed. It says ‘Finally we meet, young brother. Stay on course. We need you.’ A copy of a Zadie Smith book has her referencing an injoke we had about dubstep when I did a podcast with her. Two writers I respect and admire treating me like I could be an equal – it’s very inspiring. 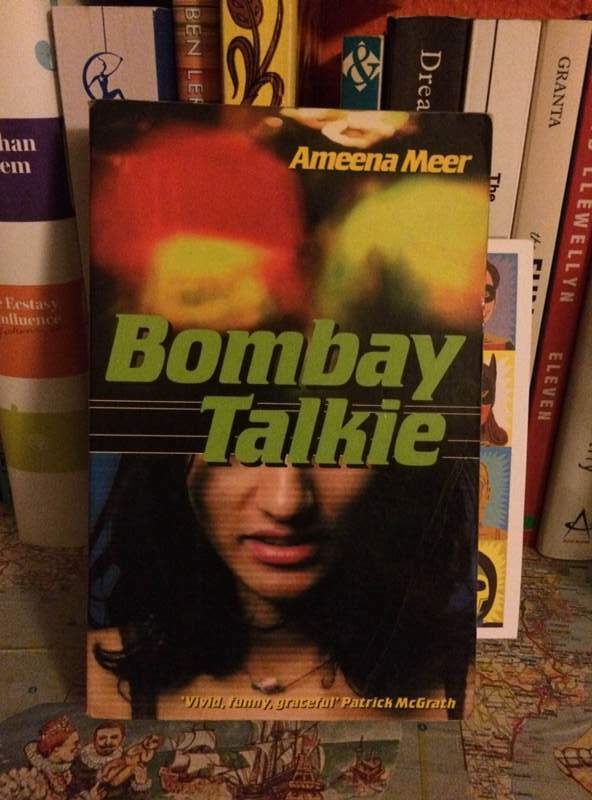 The most cherished book that doesn’t involve a namedrop is my tattered copy of a book called Bombay Talkie. It came out in like 1999 or 2000. I found it in my university bookshop. It’s the only book that Ameena Meer wrote. It is the book that set me on my course because it told a story I knew I had to counter with my own. It’s really special in my heart because reading it was my day dot of wanting to be a writer. My mum read Mills and Boon books and my dad has only read an Aristotle Onassis biography. They’re not big readers. I tried to read Crime and Punishment when I was 11, because the pretentious narrator of a Paul Zindel had read it. I didn’t get it. Hell yeah!! Now I don’t collect records or box sets anymore because of streaming services, I collect books. I just bought The Box, by Gunther Grass, because it’s my book club’s next book. It’s okay. I also used the dreaded *m*z*n to buy a book that doesn’t have a UK release date. It’s called Delicious Foods by James Hannaham. It’s incredible. I’m shocked no one in the UK is going to take a punt on it. I also preordered at my local Foyles the debut book by Katherine Woodfine. She’s one of my closest friends and that book is headed directly to the homey shelf. Oh my god, yes! 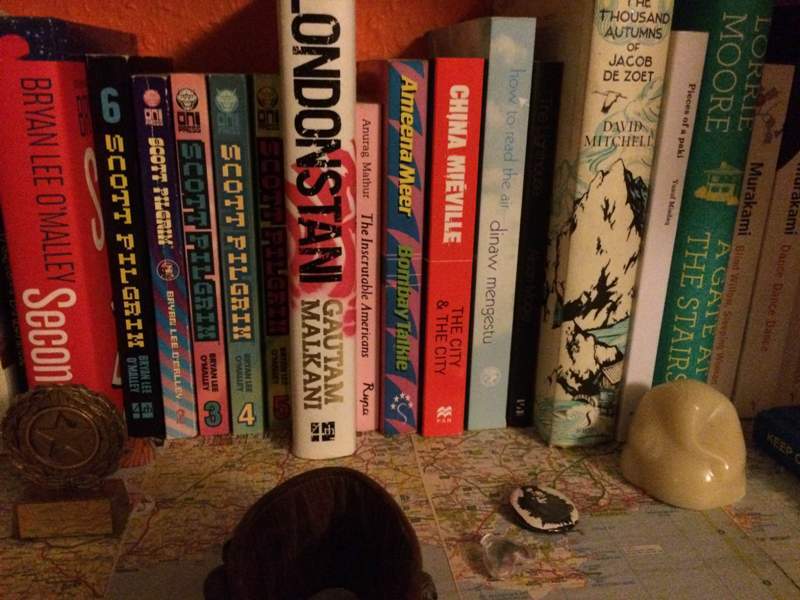 I sold my comic book collection in my mid-twenties so I could go travelling. I wish I hadn’t. Also I leant my brother-in-law my copy of the now-out-of-print The Intuitionist by Colson Whitehead and I need it back thanks. I bet he’s only read 40% of those. Which is a lie. It’s more like 47%. 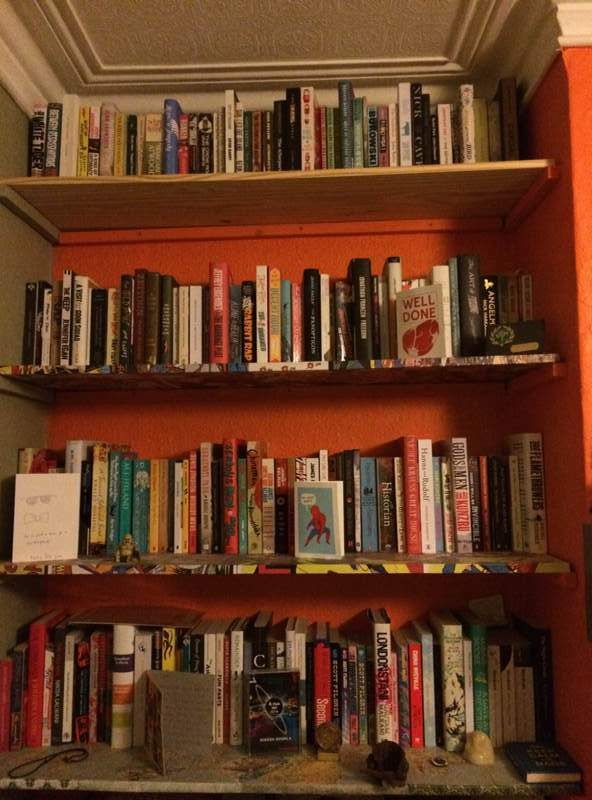 A huge thanks to Nikesh for taking part in Other People’s Bookshelves, here’s hoping I can get Ann Kingman to do it in the future too! If you would like to catch up with the other posts in the series of Other People’s Bookshelves have a gander here. Don’t forget if you would like to participate (and I would love you to – hint, hint, hint as without you volunteering it doesn’t happen) in the series then drop me an email to savidgereads@gmail.com with the subject Other People’s Bookshelves, thanks in advance. In the meantime… what do you think of Nikesh’s responses and/or any of the books and authors that he mentions? So today is my birthday and I have turned the ripe old age of thirty one, which means I officially can no longer pretend I am in my ‘very late’ twenties, rather like at New Year I use my birthday to put the last year into perspective and focus myself for what I want in the year ahead. As it was the big 3-0 last year I pondered looking a decade forward and choosing forty books to read before I was forty. I promptly then went off the idea and popped it on the back burner for another time. Well that time has arrived. I have spent the last few days whittling over books that I feel it would be good to give myself, albeit rather loosely, a nudge in the direction of reading. Some of the books were ones, like ‘Middlemarch’ which will get a special mention shortly, which I have been simply meaning to read, other more modern books I have been intrigued about. I was also greatly helped with my new edition of ‘1001 Books You Must Read Before You Die’ (not that I am suggesting this will be on my 40th heaven forbid) which I have spent long periods mulling over. So there they are! I have also made sure I miss some famous classics (‘The Leopard’, ‘The Iliad’, etc) and some lesser known ones (‘The Odd Women’, ‘A Crime in the Neighbourhood’) but those are on my periphery too plus I also need to have some for when I do my fifty before fifty don’t I? Now you may have noticed that there is one book which breaks the trend slightly and that is ‘Middlemarch’. Which leads me to a little announcement, and I hope those of you joining in with Classically Challenged won’t be cross, as I have decided to postpone writing about it on the last Sunday of March and am moving it to the end of June. I know, I know, June is ages away. However after some thought, and having only got eight chapters in so far, I decided I don’t want to rush this read (and I am enjoying it so far) because of a deadline and with a fairly long trip to London next week, plus a literary festival to prepare and read for, oh and those solo podcasts too… you get the picture. I simply want to enjoy ‘Middlemarch’. So what do you make of the list? Which have you read and which have you been meaning to? Let me know and I promise I will be back next week, well tomorrow, catching up on all the comments that I have been meaning to for ages. In the meantime there are things to unwrap, candles to blow out, cake to eat and some serious applying of anti-aging cream to be done! Well actually the first decision was a pretty easy one. I wanted one to be a non fiction novel regardless, and I have always liked letters and diaries and so ‘The Diary of a Young Girl’ by Anne Frank fitted the bill and is a book I have always meant to read. What has stopped me? In all honesty I have always been worried it might not affect me and what that would say about me. Is that bad? Anyway that was my first choice. I decided I wanted one of the books to be rather chunky, and ‘The French Lieutenant’s Woman’ by John Fowles ticks lots of boxes. Its set in my favourite period in history, the Victorian era, has a fallen woman at its heart and John Fowles is an author I have wanted to return to. Oh, and it has a gorgeous new cover which popped through the door the other day. Oh, and… the lovely Karen has chosen it for her Cornflower Book Group in April, so maybe a few of you could join in. 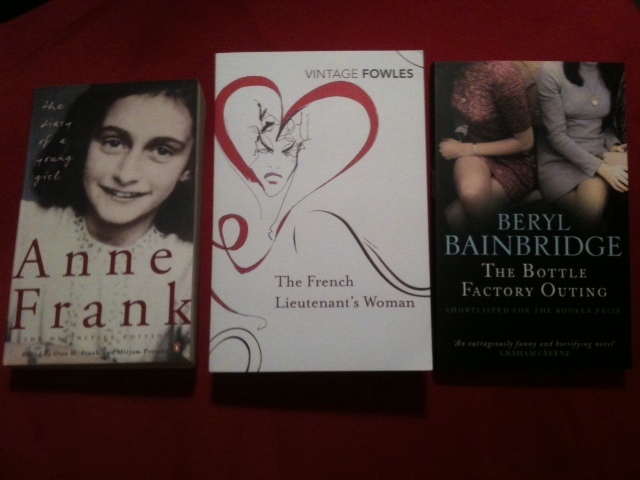 Last but not least (and I might not read them in this order anyway) thanks to Annabel of Gaskella who mentioned Beryl Bainbridge, yet another author I have ‘always meant to read’. Well on World Book Day I wanted to buy a book and not something new. ‘The Bottle Factory Outing’ is one I have heard great things about and sounds like a good way in so that is the third and final choice. So what about the forty to read before I am forty. Well you mentioned some corkers (some I had read and loved but that means we are on a wavelength) and here is the list of the twenty four titles that have come in so far that could end up in the mix. Isn’t it a great and rather diverse list? Would you second any of these? Are there any that I might be missing and should consider (there is still space for sixteen more, and I might change some), if you think so do let me know. What do you think of my three before thirty? Let me know if you fancy reading any of them too.